Many species on the planet, whether they be birds, fish or insects rely on the earths magnetic field to guide migration or assist navigation. This remarkable sense is known as magnetoreception. One idea that aims to explain how animals detect magnetic fields is known as the magnetite based theory of magnetoreception. This theory holds that mechanosensitive ion channels coupled to an intracellular compass made of an iron oxide called magnetite (Fe3O4) transduce local magnetic information into a neuronal impulse. This hypothesis originates from the discovery of magnetotactic bacteria. These aquatic bacteria use the Earth’s magnetic field to direct swimming towards growth-favouring regions in natural waters. It has been shown that magnetotatic bacteria possess organelles called magnetosomes. Magnetosomes consist of membrane-enclosed magnetite crystals that twist into alignment with the Earth’s magnetic field – thereby directing bacterial movement. Previous studies have asserted that pigeons employ a magnetite containing sensory apparatus located at six specific loci in the subepidermis of the beak. We have shown that this dogma is false, and in reality clusters of iron-rich cells in the beak of pigeons are macrophages not magnetosensitive neurons (Treiber, Salzer et al. 2012). 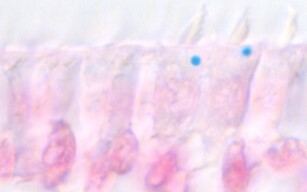 Figure 1: Shows pigeon hair cells stained with Prussian Blue, (which labels ferric iron), and nuclear fast red. A single iron-rich organelle is found per a cell, and it is located beneath the stereocilia. So where are the magnetosensory cells in avian species? 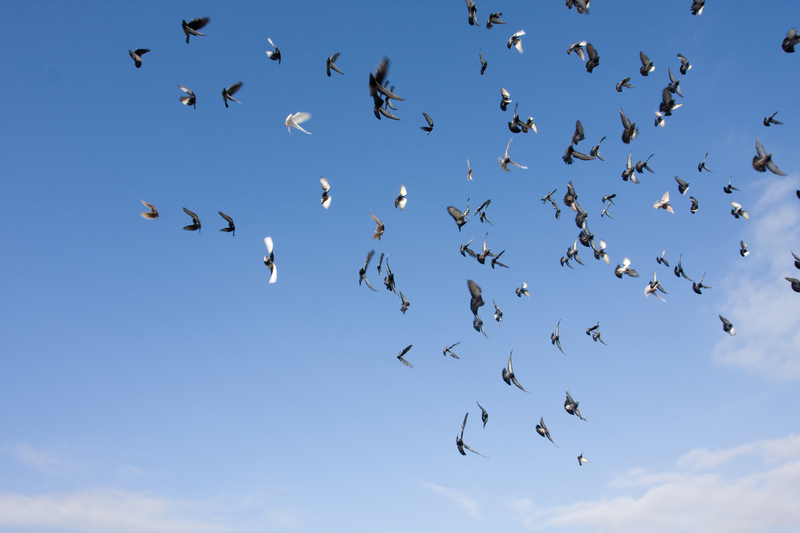 Recent studies have implicated the inner ear in magnetic detection in pigeons (Wu and Dickman 2012). We are employing histological and magnetic tools to identify putative magnetoreceptors in the inner ear. Most recently we have discovered an iron-rich organelle that resides in the cuticular plate of avian hair cells. We are currently investigating whether this structure, “the cuticulosome”, plays a role in magnetoreception in pigeons.